Shipping: IS FREE! We take care of it for you. 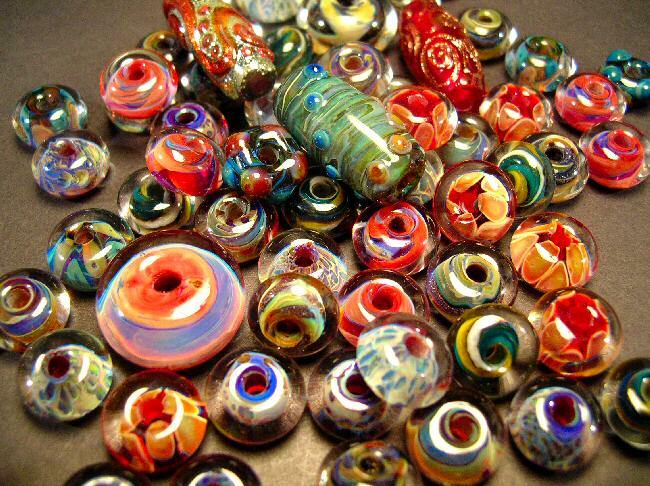 Whether its fine artisan jewelry or lampwork, we do not feel you should have to pay "extra" above and beyond the cost of your beautiful jewels! All items are shipped by United States Postal Service, FIRST CLASS, with insurance! If you are in a rush, just let us know. If you would like to incur the fees to ship Priority, Fed Ex Two-day, or even overnight then we can do this for you. International Packages will ship Global Priority. Please email us for the costs of these special shipping methods. Payment: We are set up to accept credit card payments through Paypal. If you have never used Paypal before, it is very Safe, Easy and most of all, FREE! All you need to do once you have chosen an item, is enter your credit card or debit card information, and they take care of the rest! Paypal is very secure. They utilize the SSL protocol, featuring the highest level of security commercially available. Your private information is also secure, as their servers sit behind an electronic firewall and are not directly connected to the internet. You can use Visa, Mastercard, Discover, American Express, Instant transfer from a bank account, or Echeck. How to Order: Just click on the add to cart button next to an item, or the Buy Now button for lampwork pieces. Paypal will take care of your checkout and total. We will send you a confirmation email with all of your ordering information. Please make sure to check the shipping address that you enter through Paypal, as this will be the address we will use to send you your wearable art. Our Guarantee: With care, our jewelry and lampwork will last for years! We want you to be completely satisfied with your 5Fish products & feel wonderful wearing them. After you receive your piece in the mail, if you are not satisfied, please email us immediately and we will give you a full refund less your shipping cost upon receipt of returned items. If any item should break in the next 90 days, we will repair it try our best to recreate it for free! We build our jewelry and create our lampwork to last many lifetimes and feel confident that this will not be a problem but want to put this out there "just in case". Sorry, letting the kids use your pieces to play dress up is not a valid "free repair" reason. Should an accident occur, we will charge a fee (based on time/supplies utilized) to repair the piece. Please realize that many of the items I use to create my designs are unique, one-of-a-kind, works-of-art within their own right and may not be able to be replaced (but we will do our best to make it perfect!). When you pay with PayPal, your credit card and bank numbers are never seen by the seller or merchant. Your financial information stays safe. Plus, you're protected 100% against unauthorized payments sent from your account.